PORTLAND, OREGON (April 17, 2015) – Circle the wagons! It’s time again for the most exciting motorsport in the world to make its annual visit to Oregon. 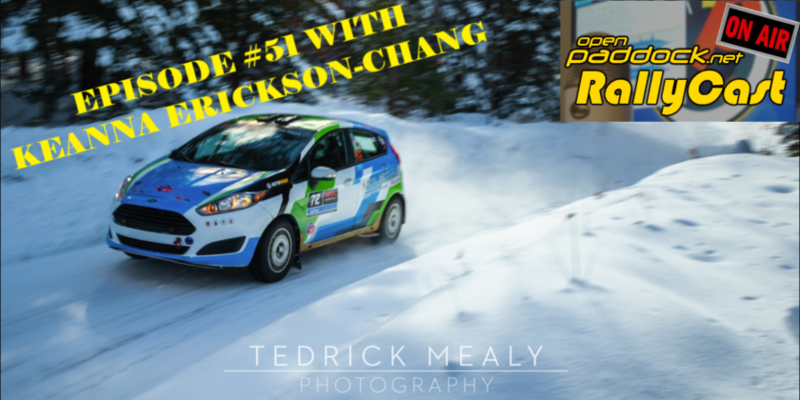 Round 3 of the Rally America National Championship comes to town April 24-26, for the extremely popular and challenging Oregon Trail Rally presented by O’Reilly Auto Parts. Top drivers in several classes of competition vehicles will come from across the U.S. and world to drive on some of the best rally roads in America. The event is the most popular on the eight event national schedule and has attracted more than sixty domestic and international teams and legions of fans. 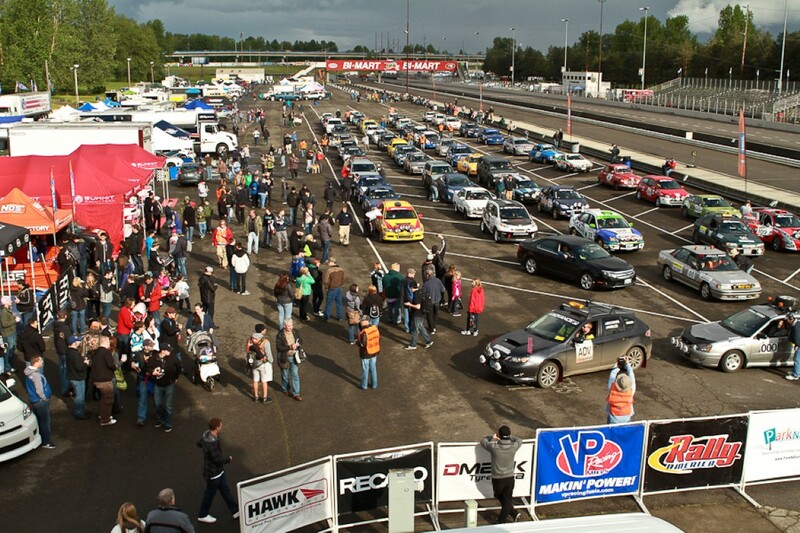 It begins Friday evening with four stages of tarmac and gravel roads at Portland International Raceway (PIR). A new format has been developed at PIR which will give fans the ability to see the cars compete in multiple areas of the track with night time lighting, several PA announcers and new “yump” which will see the car catch some air as they cross a jump. The continuous race action at PIR is a fan favorite with teams being easily accessible for photos and autographs prior to the start of the event. After the PIR stages, the event moves east towards Dufur and Hood River where teams will experience the much faster roads on Saturday and then the very technical gravel sections on Sunday. With 18 competition stages and over 115 miles of competition roads, the Oregon Trail Rally will test teams to the limit. Rally racing is known as the most exciting motorsport in the world and continues to grow in popularity across the US. The Oregon Trail Rally is known as one of the toughest tests for rally racing teams as they take on the challenging Northwest forestry roads. While the event is held in late spring, unpredictable weather conditions have always been a factor for competitors. Coupled with the tight and twisty nature of the racing stage roads quite often make this event a battle of attrition. 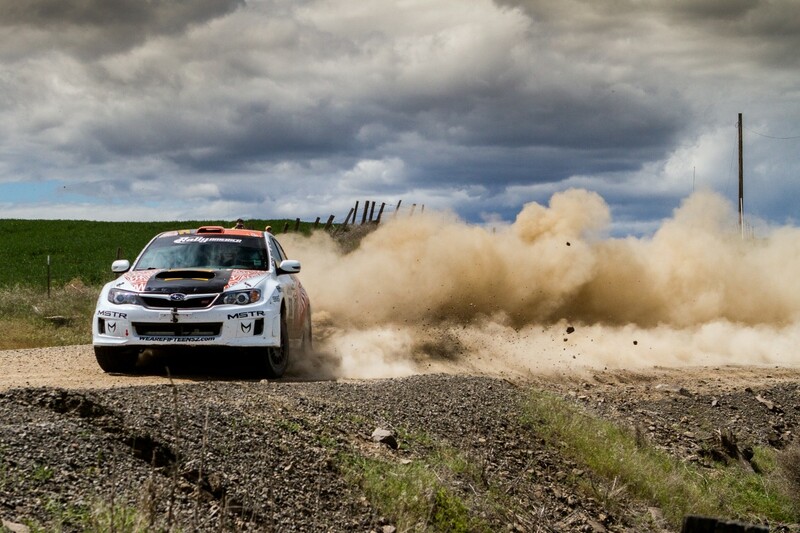 Current Rally America points leaders, David Higgins and Craig Drew of Subaru Rally Team USA, arrive in Oregon to defend their 2014 National and Oregon Trail Rally titles. Higgins and Drew opened the new season with wins at both Sno*Drift Rally and Rally in the 100 Acre Wood. Now, Higgins returns to the Oregon Trail Rally where he has won the event six times before, including the last four consecutive years. Adam Yeoman of FY Racing has been making big steps in the development of his own Subaru and hopes this year to give Higgins some competition. The Super Production (SP) Class battle will be hotly contested with a deep field of international, national and local teams. Gary Gill, Indian National Rally Championship driver, returns to Oregon leading the SP points table. He is being chased closely by San Francisco native, Lauchlin O’Sullivan, and Minnesota driver Nick Roberts. Local hot shoe Paul Eklund, of Tigard, will provide stiff competition in this class, driving his Primitive Racing Subaru Impreza WRX STI. 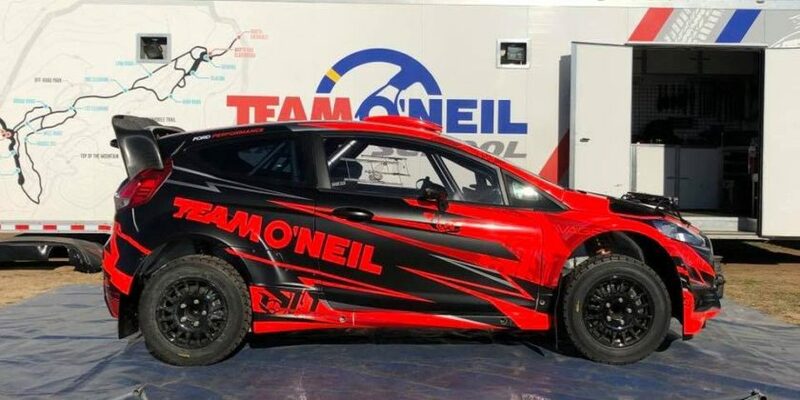 Sixty teams are expected to compete at this year’s Oregon Trail Rally, making it the largest assembly of rally cars in the nation for this year’s Rally America National Championship. The event is also the kick-off event for the Northwest Regional Rally Championship as over 32 local OR & WA teams vie for Championship honors. On Saturday night, April 25th, from 7-9pm, the charming 4th Street in Hood River will be the backdrop for the Double Mountain Block Party with an outdoor beer garden, food and a live band DJ. With several hundred fans in the area to watch the competition stages that day, event organizers wanted to provide the public with the opportunity to “meet and greet” the national competitors and view their cars at the Double Mountain Brewery and Taproom. 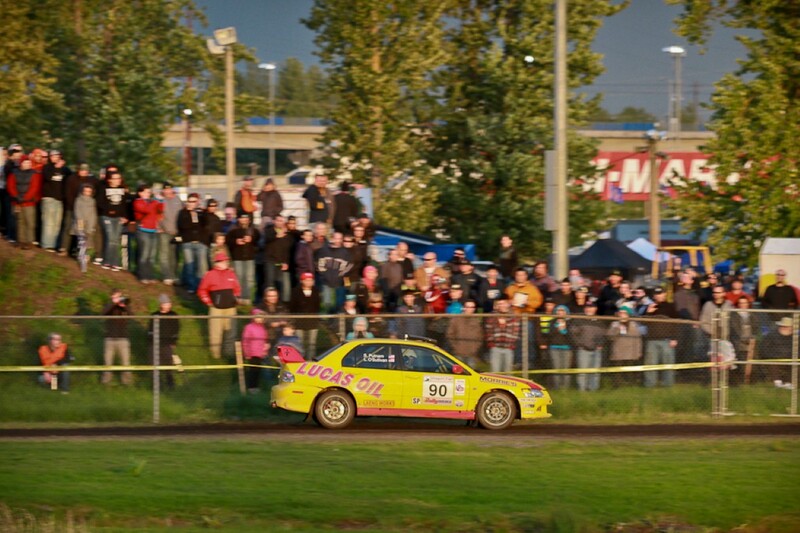 Primitive Racing Team of Paul Eklund (Tigard, OR) and Karen Jankowski (Vancouver, WA) will challenge National competitors in their Super Production class Subaru Impreza. Vancouver WA resident and driving instructor, Scott Kovalik is excited to have his freshly rebuilt ERS Mitsubishi Evolution back on the NW stages. Mother-daughter team of Kristen and Janice Tabor from Tigard/West Linn, who have been competing together for twelve years, have moved up to Open Light class in a Subaru Impreza RS. Kristen and Janice are the only all-female team in the event. Jeff Seehorn (Rockford, WA) started his motorsport career as a Professional AMA rider. This is Jeff’s second season in rally and he is expected to surprise many more seasoned teams. Nameless Performance, a tuning/fabrication shop in Woodland WA, will debut their much anticipated Subaru BRZ, driven by 3 time Rally America 2wd champion and USA’s only World Rally Championship (WRC) Academy competitor Chris Duplessis. Tickets are available from the event website (www.OregonTrailRally.com) or at the PIR gate. Gate Pricing is $12 for adults and $6 for children. Purchase tickets online to save $2. Children under 6 with an adult are free.